You wouldn’t hire just anyone to build your home, so why would you consider letting just anyone pave your driveway? TCP Asphalt provides affordable, professional asphalt paving services for residents of the Dallas/Fort Worth metropolitan area, Fort Stockton, Alpine, Pecos, and Tilden. The sun and weather of our great state take a toll on our driveways, walkways, and roads, but your wallet and reputation shouldn’t take a beating with your paved surface. Wondering whether you should use Asphalt, Chip Sealing, or a different type of paving or walkway service? Look at how we pave using asphalt and some of the benefits of asphalt laying. How does the Asphalt Paving Process Work? Asphalt paving takes a little longer than chip sealing, however, the results of the paving process are stunning, safe surfaces we can move easily over. Because the paving must be done on an entirely clear surface, the process starts from the bottom up. TCP Asphalt doesn’t skimp on the steps because we know you deserve the best result. First, demolition is done on any existing asphalt, pavement, or chip-sealed area. We remove the debris from this job, and then we get started on grading the surface. Grading is the preparation of the road that allows it proper drainage and laying of the asphalt itself. Once we feel the road has been properly graded and sloped, we commence with the application of the sub-base. The sub-base is a layer of aggregate material which provides acts as a frost layer and prevents frost and other weather damage (such as frost heaves). The sub-base is arguably the most important part of the process. After a quick proof roll, which tests the strength of the sub-base and surface, the actual paving begins. But actual paving does not mean laying down the layer of asphalt and calling it good. It entails application of a binding agent and then the asphalt itself. Finally, after making sure it joins smoothly with existing roads and walkways, we do a final roll to ensure your surface looks neat, tidy, and is structurally sound. Why Choose Asphalt Over Other Resurfacing Options? Repairs to asphalt surfaces are affordable. It might seem like a hassle to repair your paved surfaces as the years take a toll on them, it is often more affordable to fix asphalt than any other paving solution. Obtains its looks for years. Concrete and other lightly-colored surfaces run the risk of holding onto stains from oil, fire, rubber, and other things it encounters because of the nature of the materials and because they are not black. Black asphalt hides stains and continues to look pleasant for most of its life. Durability. 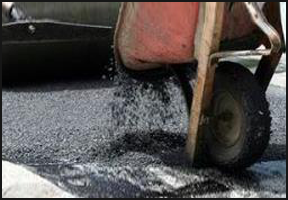 Asphalt, if appropriately laid and made with quality materials, can last up to 20 years. This turns what might seem like a significant investment into an investment that pays for itself for years. In cold weather climates, asphalt is often chosen for its durability, as concrete can crack in environments that are consistently cool. When Might I Need Asphalt Services? Asphalt surfaces are sought after for many reasons. Residential clients often prefer the smooth, finished look of asphalt to other paving options, such as chip sealing or concrete. They also provide a safe, even finish which is optimal for runners, those who need assistance walking, and golf carts. Therefore, it is a widely-accepted choice for many commercial resurfacing needs. How Long Does It Take for Asphalt to Set? Asphalt takes a full year to cure. But that does not mean you need to avoid driving on it! TCP Asphalt recommends letting our asphalt services sit for a full 24-hours without anyone driving on or walking on the asphalt. That will ensure a smooth finish while time does the rest. TCP Asphalt is committed to getting your asphalt driveways done right the first time. Our company has over two decades of experience in the business, and we take pride in our local employees and their passion for what we do. As a way of giving back to our community, we also offer a 10% discount on services for churches. Although we operate out of Dallas, we serve the Dallas/Fort Worth metropolitan area, Fort Stockton, Alpine, Pecos, and Tilden. For more information, or to get started on a quote for your asphalt paving needs, please call us at (254) 233-1121, or reach out to us via our contact page. Rely on our professional paving contactors in Dallas, TX and the surrounding areas for residential and commercial constructions. By turning to us, you will be able to have a brand-new driveway, sidewalk, patio, or other structure created for your location. Each member of our team has the received the training necessary to complete any type of paving project you want done. Our specialists will even repair and pave community roads. It doesn’t matter if you are a homeowner or a proprietor; our construction team can assist you. Our asphalt paving services in Arlington, TX have helped various companies and organizations, such as churches and municipality associations, with their projects. If you’re interested in hiring our asphalt paving company in Fort Worth, TX, contact us today at (254) 233-1121. Performing our asphalt paving services in Arlington, TX comes easy to us no matter who or what the client. To start a job, we begin grating and leveling the site surface. We then prep it and pack the base with impaction rollers. From there, our professionals install the hot asphalt using a state-of-the-art paving machine. The material is then packed and the surface is rolled.